CHICAGO—For many families and children in Englewood, one of the poorest communities in Chicago, the holidays can oftentimes just be dreary days, especially if there is a loved one missing from the picture due to being incarcerated. 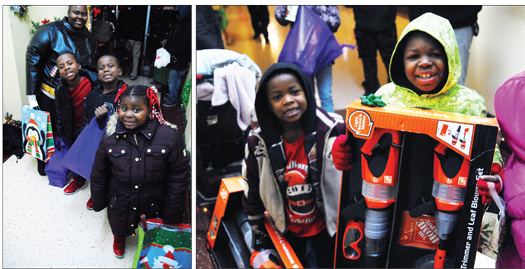 For the last four years, the CHIP Program (Children Having Incarcerated Parents), through Life Builders United, helped bring smiles to more than 400 children with free gifts, food and entertainment at the Old Masonic Hall, right in the heart of Englewood. In addition, many of those volunteering their time to ensure the event ran smoothly were all formerly incarcerated. If you added up the time spent in various state and federal institutions between them, that time would stretch well past 350 years. When asked why they were giving their time to see to it that kids in Englewood enjoy a special day, the answer was almost universally the same: They helped contribute to the negative conditions in Englewood, so it’s time to come back and help rebuild and reshape the direction of the community. “When I was incarcerated, I heard about Life Builders which was founded by Ms. Geraldine Smith. I wrote her and didn’t get a response. And being from Englewood, I heard about her story and wanted to be a part of her program. So, as soon as I got out and was able to move around freely, I came over here and introduced myself to Ms. G.,” Tyrone Muhammad, author and founder of Ex-Cons for Community and Social Change (ECCSC), an organization committed to helping ex-offenders avoid becoming repeat offenders, told The Final Call. Ms. Smith’s story is unique in that she spent nearly 20 years on death row, after being convicted of murder in 1989, becoming the first woman sentenced to death in the state of Illinois since 1938. Upon her release from prison in 2008, after the Supreme Court of Illinois deemed that her sentence was too harsh and overturned her conviction, Ms. Smith returned to Englewood and began doing positive work in the community for women and families—most notably, starting the Life Builders organization, as well as CHIP and the GG Group (Grandparents and Guardians). Her work and impact in Englewood has inspired others from the community who were also formerly incarcerated to lend a helping hand wherever they can to try and steer others away from the street-to-prison path that has seen millions of Black men incarcerated over the years. “I first heard about Life Builders in 2013 when Ms. G. was first getting Life Builders United off the ground. I literally lived across the street. I came out one day and saw that they were getting ready to put on a back to school function. I came over, introduced myself and asked how can I get involved and I’ve been dealing with Ms. G. ever since,” Earl Walker, business owner and founder of GUTS (Giving Up The Streets), a group that mentors young Black men and challenges them to have the courage to make better choices in life, told The Final Call. Mr. Walker, upon his release from prison, got involved in a business incubator program and received funding to start a personal training business. From there, he worked to complete his Associates degree at Kennedy King College, his Bachelor’s degree in psychology from Chicago State University, and will be beginning a Master’s program in criminal justice in the fall. He has also branched out and started other ventures that provide employment opportunities to other Black men who have found their way into the system and are looking for a way out. The presence of women like Ms. Geraldine Smith and men like Tyrone Muhammad and Earl Walker, all of whom have been incarcerated and understand the negative impact of being away can have on children, made the CHIP Program event a success. In a community where many residents feel that no one cares, seeing people who do was a welcome moment and added to the laughter and smiles of the day. With members of the Nation of Islam present alongside community activists such as Tio Hardiman, other leaders as well as popular DJs from Chicago’s urban radio station Power 92, it gave those who participated in the event a glimpse of people who haven’t forgotten about them and want to see them lifted up in a world and life that seems to constantly beat them down. Ms. Geraldine Smith, author of Remember Me and A Pleasant Encounter, is “Chief Servant” and CEO at Life Builders United, Inc. She has a weekly radio show on WYCA 103.3 FM radio and be reached at 773-504-2125. Or email lifebuildersunited@gmail.com, and visit www.lifebuildersunitedinc.webs.com. Tyrone F. Muhammad, author of Men on the Inside, is founder of ECCSC, an organization committed to helping ex-offenders become productive members of society rather than repeat offenders. He is also a mentor, entrepreneur, public speaker and social activist. Connect with him via Facebook at “Tyrone Muhammad” and on Twitter: @TyroneMuh. Earl Walker, founder of Give Up The Streets (GUTS), is a businessman and community mentor, who focuses on young Black men, their personal development, their lifestyles and teaching conflict resolution strategies. He can be reached via email at GUTS1@yahoo.com or chimmaculate@yahoo.com.